Innovyze President Dr. Paul F. Boulos Joins ACEC Design Professionals Coalition Broomfield, Colorado, USA, December 29, 2015 Innovyze, a leading global innovator of business analytics software and technologies for smart wet infrastructure, today announced that its president, COO and chief technical officer, Paul F. Boulos, Ph.D., BCEEM, Hon.D.WRE, Dist.D.NE, Dist.M.ASCE, NAE, has been appointed to the Design Professionals Coalition (DPC). The DPC, a coalition of the American Council of Engineering Companies (ACEC), was established in 1983 to develop and advocate for policies related to the business interests of large design/engineering firms and the public good. Its membership includes senior executives of the nation’s leading engineering, architectural, surveying and mapping firms. Member companies are multi-disciplined, multi-practice firms with both domestic and international practices, and employ alternative project delivery as well as design-bid-build approaches. 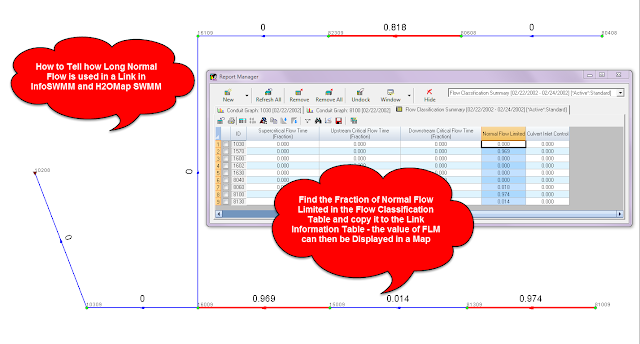 Find the Fraction of Normal Flow Limited in the Flow Classification Table and copy it to the Link Information Table - the value of FLM can then be Displayed in a Map using the Map Display command. In this small example, three links primarily used normal flow and one uses it for a short time. Normal flow only uses the Manning's equation and the link upstream depth, hydraulic radius and cross sectional area to compute the flow. Journal of the American Water Works Association, 107(12), December 2015.